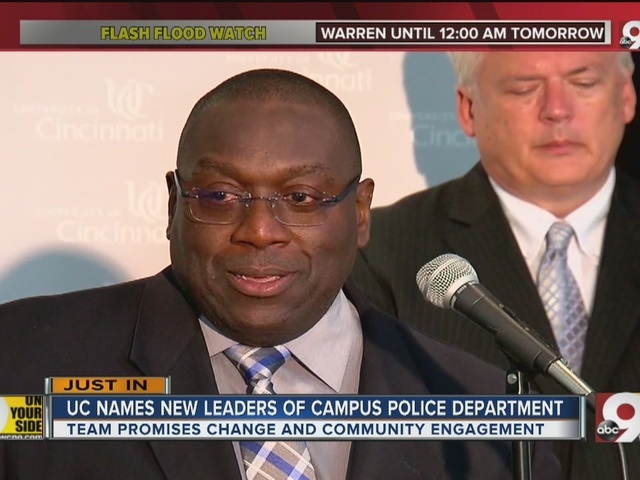 CINCINNATI – University of Cincinnati officials named Anthony Carter as the university police department’s new police chief and Maris Herold as the new assistant police chief Thursday. Carter is the chief of law enforcement for the Federal Reserve Bank’s Cleveland-Cincinnati branch and a former Cincinnati police officer for 23 years. 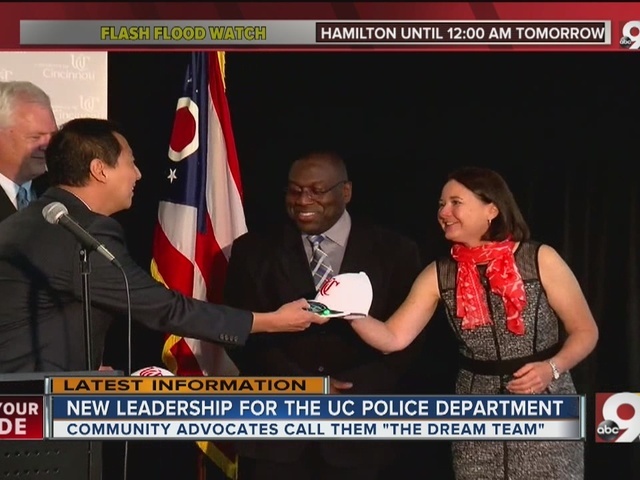 He said he was "distinctly proud to take over as the police chief here at UC." He pledged to be visible and use a "customer-friendly" strategy of policing. Herold is a special project captain in the Cincinnati Police Department. She joined CPD in 1993 and was previously the District 4 commander. “There’s little doubt in my mind that we will accomplish great things at UC,” she said. Robin Engel, the university vice president for Safety and Reform, said university officials aim to be a model of voluntary reform for others across the country. Carter and Herold bring the leadership that the department needs to meet that vision, she said. “These are the leaders who are going to help guide the next generation of men and women at UCPD to even greater heights,” Engel said. University Director of Police Community Relations, S. Gregory Baker, said the search committee worked with students, faculty, staff and community members. Seventy candidates applied for the positions. Following a national search, "It turns out the best of the best were right here in Cincinnati," UC President Santa Ono said. Former UC Police Chief Jason Goodrich and Maj. Tim Thornton resigned in February amid an external review of the department. The university began a top-to-bottom departmental review after one of the department’s officers, Ray Tensing, was charged with murder in the shooting death of Sam DuBose last summer. Since then, university officials have also brought on other new public safety leaders, including James Whalen as director of public safety and interim chief, Baker as director of Police Community Relations and Engel as vice president for Safety and Reform. In April, an independent firm hired by the university completed their own report on the department. They found that Goodrich and Thornton championed the off-campus traffic stops strategy, but failed to take “fundamental steps” to make it a success. After the DuBose shooting, they also failed to take ownership of the strategy, according to the report. Carter said his experience in urban policing and communication will help restore trust on and around the UC campus. "There will be several things we don't agree on. But, if we understand each other -- we've taken the time to listen to each other -- taken the time to hear the concerns and respond to each other in a respectful manner, I think you then start to build trust," he said. Herold said she'll be reviewing department policies and procedures, and making changes as needed. "As you know, CPD has been through a very similar incident, and I was a big part of the collaborative agreement with problem solving data-driven strategies, evidence strategies, most certainly training," she said. "I've been a big part of the training agenda for the collaborative."